"I was extremely satisfied with, the turnaround time on my order. The pricing & craftsmanship were phenomenal. Thank you trophy outlet." "We have done business with these folks for several years and we always receive the best service and products. Keep it up!" "The engraving on the trophy was much nicer than I expected. Customer service was extremely responsive and worked with me on a special shipping request." Trophies, plaques, and other awards are the perfect way to make any event special and memorable. Here at Trophy Outlet, we offer a wide variety of premium customized awards at affordable prices, so your organization can give the winners and participants the recognition that they deserve. Custom engraved trophies and awards are a point of pride for many competitors, and we make it possible to provide high-end prizes that will be treasured for years to come. Trophy Outlet is committed to delivering high quality, affordable trophies, acrylic awards, and personalized wooden plaques that suit any occasion. Order one of our many customizable engraved trophies to reward the MVP of your softball league or to honor the best of the best at your next local auto show. You can give your employees the recognition they deserve or remind your Little League soccer squad what team spirit is all about. Most orders ship within 2 days, so place your order with Trophy Outlet today to make your next sporting event, company outing, or car show a true winner. You don’t have to worry about your trophies and awards arriving after your event. Most of our orders ship within 2 days for a quick turnaround. We’ve been in the business long enough to have great connections – this allows us to get the products we need at a reduced price, so we can pass the savings off to you. Our prices are already great, but if you’re buying your awards and trophies in bulk, we offer volume discounts so you can save even more. Incredible savings and awards for all! For the past 30 years, we have honed our craft to give you only the best custom trophies and awards. We’re proud of our commitment to getting you only the best. All of awards come with custom engraving at no extra cost. All our engraving is done in-house to ensure maximum quality. We take pride in our friendly and helpful customer service. No matter your question or needs, we’re always here to guide you through our process to make sure you get exactly what you want. We’re here to help! For over 30 years, we have offered affordable, finely crafted trophies and awards, and today we are leaders in the industry because of our products, prices, customer service, and fast turnaround times. Choose from individual engraved trophies, trophy cups, or trophy sets. Customize plaque awards, acrylic awards, or medals to your exact specifications. We even have gifts such as BBQ sets, flasks, wine gift sets, and many others so you can ensure that your competitors or employees are seriously motivated! 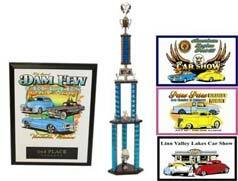 We will even include a free Best of Show trophy at car shows with purchases over $1,000. To top it all off, all of our quality awards include custom engraving at no extra charge. Awards can be used in so many different applications. For example, you may want to offer your employees an Employee of the Month plaque for exceptional work performance, or you could give your little league team something to remember the season. We work with churches, schools, youth sports teams, and many other athletic enterprises. Whether you need corporate awards for employee recognition or sports awards for your winners and participants, we have you covered. Our customers return again and again because we provide uncompromising quality on engraved trophies and other awards. 30 years in the business has given us a major advantage. Our success and longevity are due to our commitment to quality, our economical prices, our dedicated customer service, and our rapid turnaround times. If you have any questions, we encourage you to call us toll free at 866-282-0847, or feel free to email us at sales@trophyoutlet.com. You can also get in touch directly through our Contact page. Ordering engraved trophies, plaques, medals, and other awards has never been so fast, convenient, and easy. Place your order online today!